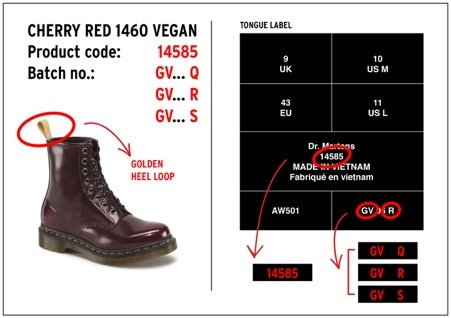 The product being recalled is the Dr. Martens 1460 Vegan Cherry Red 8-eye boot model and can be identified physically by its unique cherry-red color and golden-colored heel loop. If you are affected, please email dmreply@drmartens.com or call 800-229-1262 Monday - Friday from 8am PDT to 5pm PDT to arrange for a refund or you can return your boots to your local Dr. Martens store for credit or to exchange. In making our products, we pride ourselves on setting the highest standards. Customer safety and the integrity of our product is our highest priority.